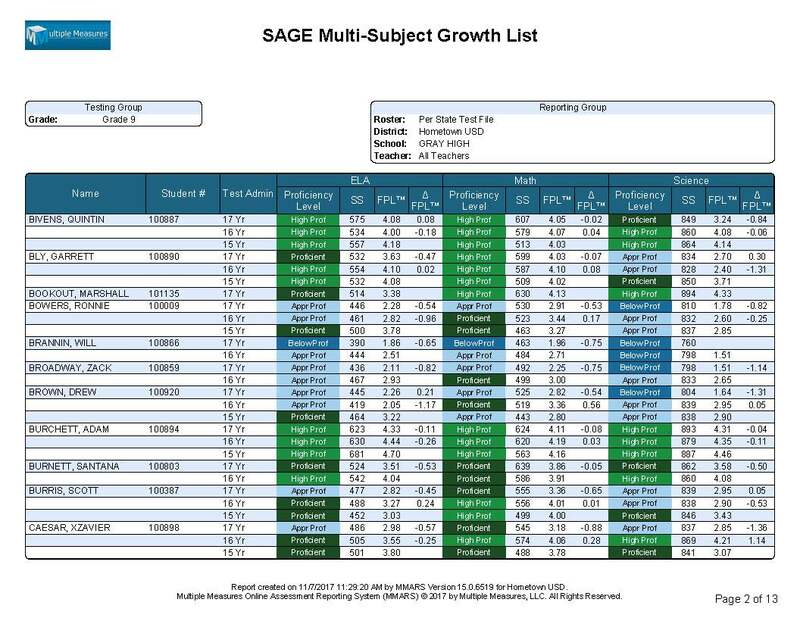 The SAGE Report Catalog provides examples of each of the reports available from the reporting menu. Note that most of the reports have several options for presentation (but putting all the possibilities here would be overwhelming). We pre-build the most commonly requested variations for you, but are happy to build exactly what you want; just ask. Jux™ summaries can change the side-by-side orientation to compare a variety of different entities, such as subjects, claims, years, terms, schools, grades, subgroups, and teachers. Student lists can display multiple years of scores, but if presenting only one year and subject, they can be ranked high-to-low or low-to-high. For help understanding the layouts of the reports, please see the SAGE Annotated Examples. 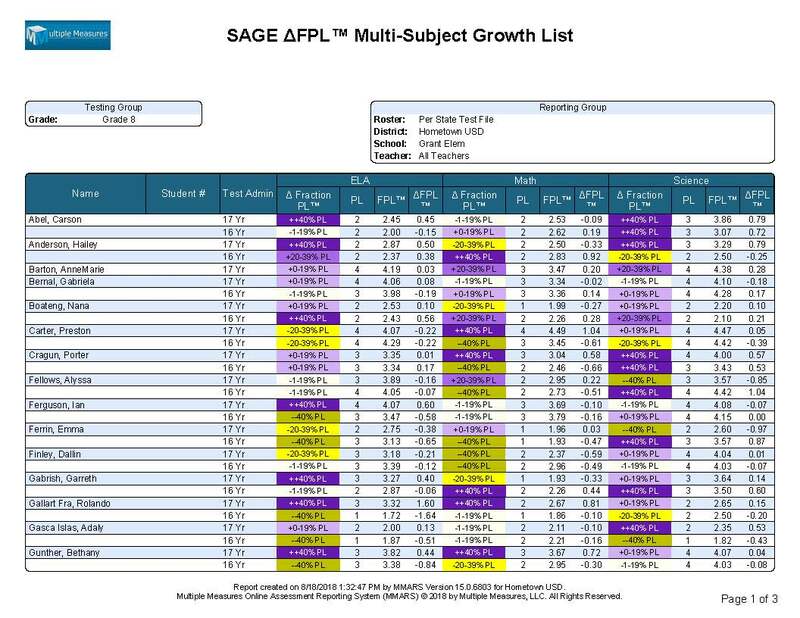 For help understanding the FPL™ change/growth scores, see SAGE Growth Metrics. This report compares the proficiency of approximately the same set of students across multiple years. This is a cohort report, so it represents the same general group of students, as they move from grade to grade, but does not adjust for mobility. 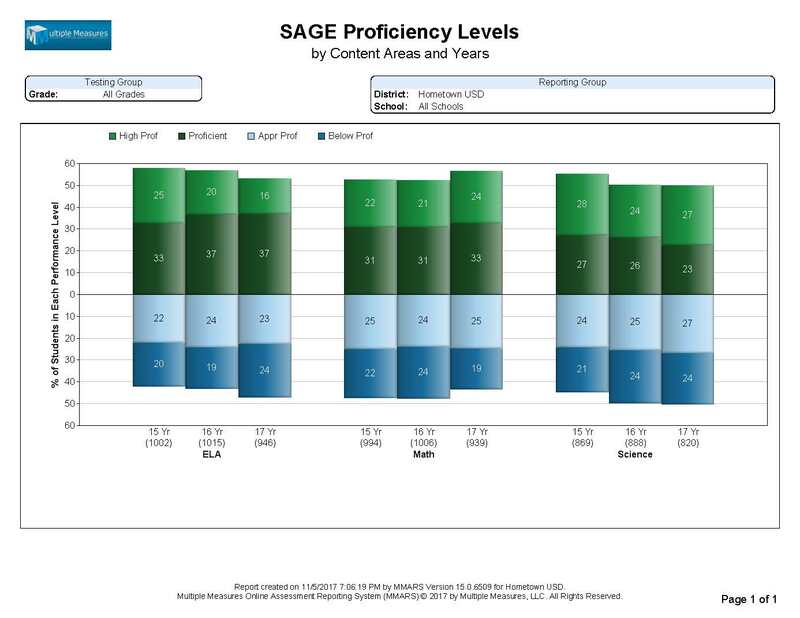 This report compares the Proficiency Levels of a given set of students, across multiple Reporting Categories, for multiple years. 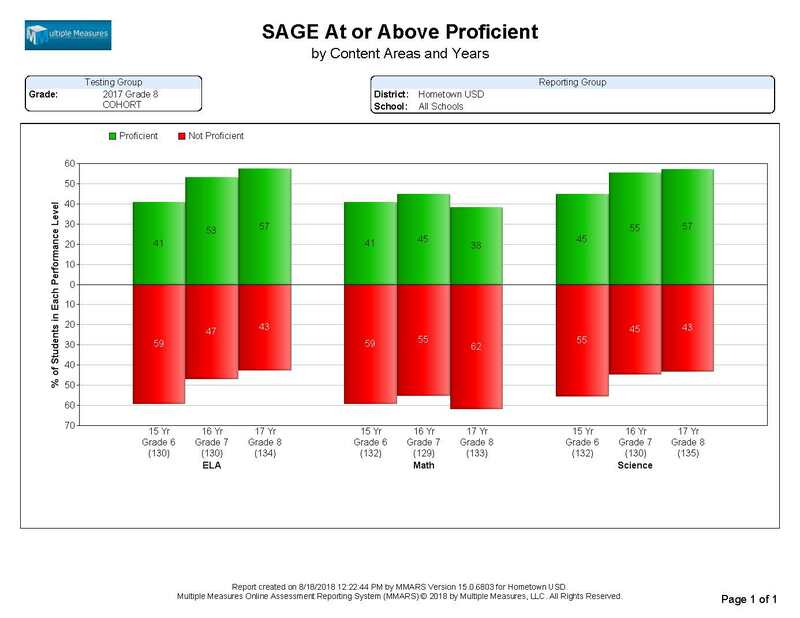 The three proficiency levels for this report are labeled as Not Proficient, Near Proficient, or Proficient. 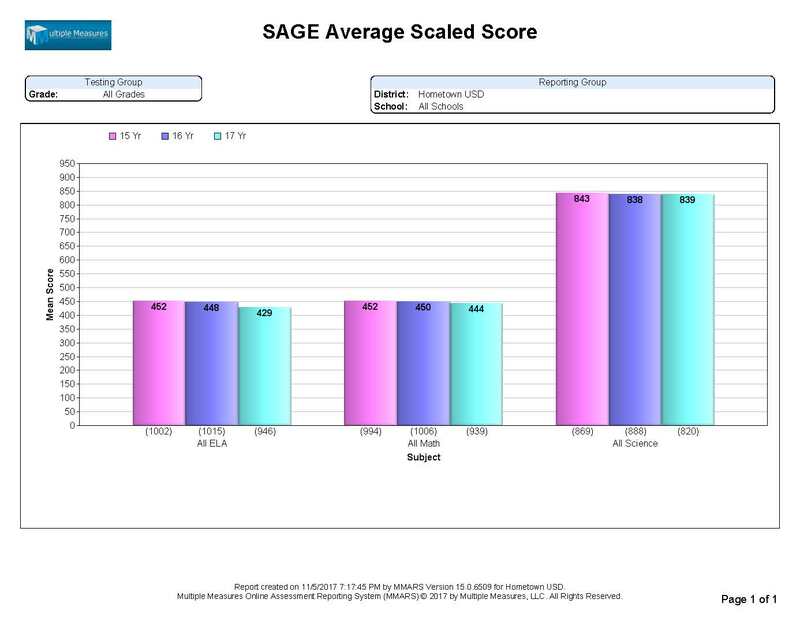 This report compares the Average Scaled Score for a given set of students tested, across multiple years. This report lists multiple years of either ELA/Literacy or Math Subject and Reporting Category scores for all of the students at a given school, in a given grade or in a specific classroom. In the example’s case, it lists only one year of Math scores for all of the 4th grade students at Polk Elementary. 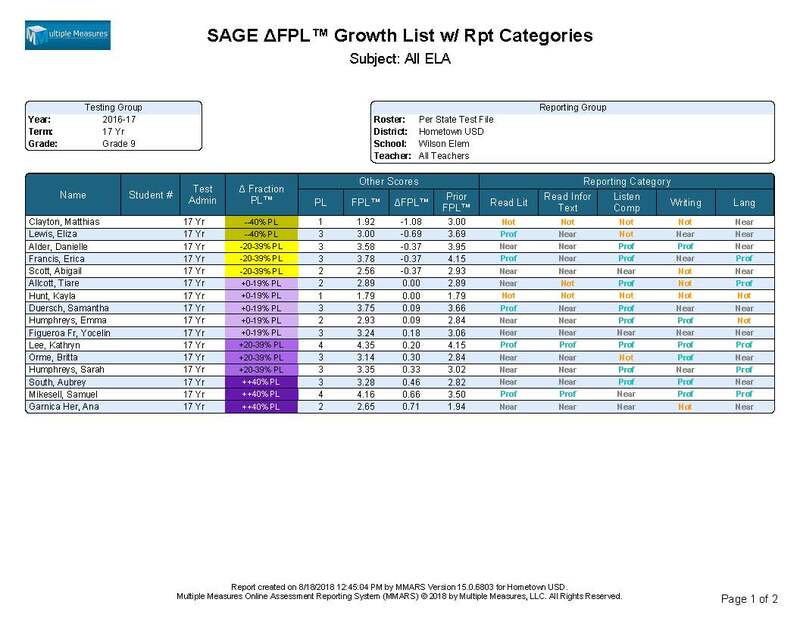 This report lists multiple years of ELA/Literacy, Math and Science in terms of Proficiency Level, Scaled Score, Fractional Performance Level™, and Change in FPL™ score types, for any given set of students. In this example’s case, this reports lists the above score types for each subject, for all of the 9th grade students at Gray High School. 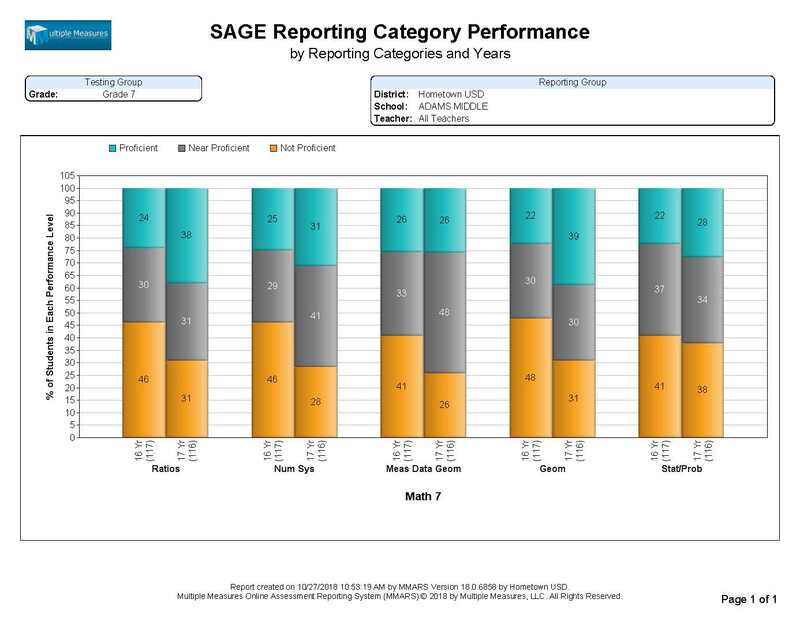 This report lists the Change in Fractional Performance Level™, alongside the Subject and Reporting Category scores, for multiple years, for any given group of students. 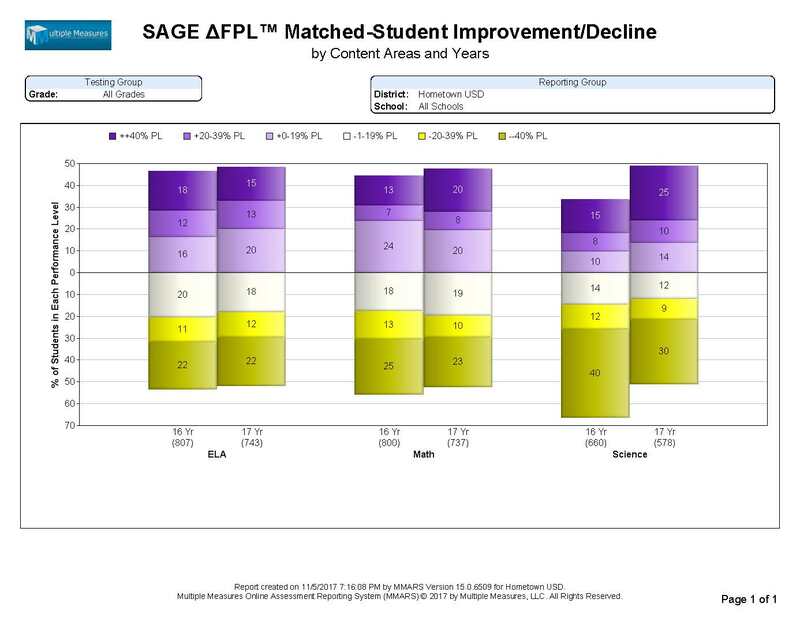 This report has been ranked in an order of Low-to-High in terms of Fractional PL™, meaning students with the greatest decrease in FPL™ are shown at the top, and students with the greatest increase are shown at the bottom. 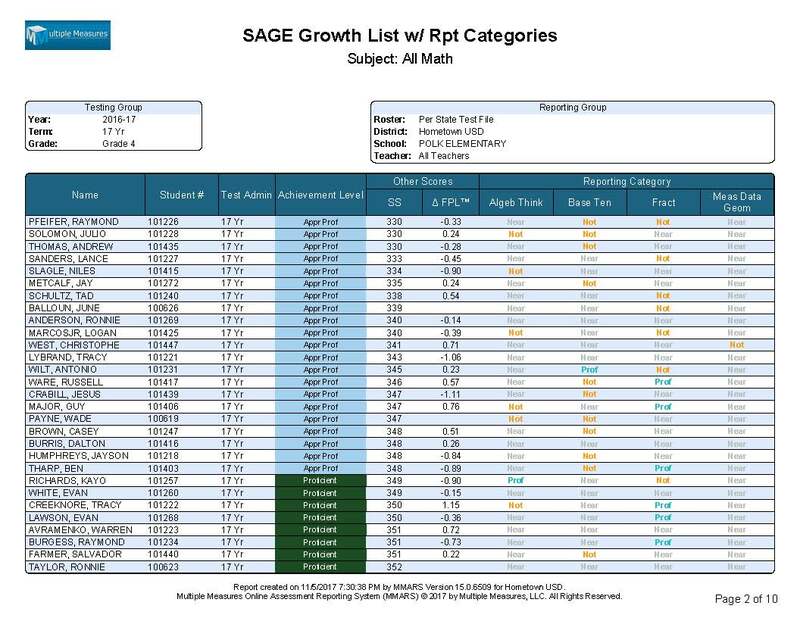 This report lists multiple years of Change in Fractional Performance Level™, alongside the Subject scores, across all three testing subjects, for a given group of students. The FPL™ growth metric measures change “between the bands,” and can be divided into classroom reports that teachers can utilize.